It’s Sunday again, and that means design team inspiration for The Paper Players! I needed a birthday card this past week for a dear friend who is hitting one of those biggie decade birthdays so thought I would use the design to make his card. I used my ALL TIME favorite most versatile stamp set in the entire world (I might be exaggerating a teensy bit, but hopefully you get my point). Lovely as a Tree from StampinUp was one of my very first stamps I bought, and one that I still use often – Winter, Fall, Summer, Christmas, Masculine, Feminine. Such great versatility. I think I did pretty good sticking close to the design sketch and like how this birthday card turned out for our special friend. Play along with us – any of you paper players! I’d love to see what you design with this sketch. Awh! Thanks so much Laura! Very nice, Jodi. I hope your friend had a great birthday . wow Jodi–just, wow! It is spectacular. I wouldn’t mind turning a decade older if I received THAT. It is beautiful. My ‘paper playing’ has taken the form of following the YouTube instructions of master paper popup designer, Peter Dahmen https://www.youtube.com/watch?v=B_eZ5PSxwUA. It is an intriguing pastime. Thank you for showing this design. cool pop-up! 🙂 Thanks for sharing Lance! And for your kind compliment! Jodi, this is absolutely beautiful! Awesome birthday card! 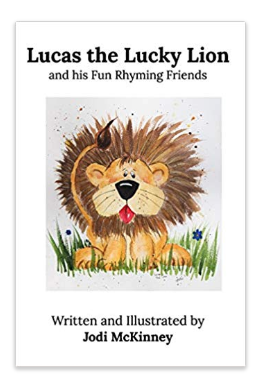 I recently found your blog – lucky me!! I spent hours going through your posts saving recipes and admiring your art. Wow, Linda! Thanks for making my day! That’s beautiful! I have one or two stamps with trees. I haven’t used my stamps in eons, and have recently thought about trying to sell them. Most of mine are on wood blocks. I see they don’t make many like that anymore. I wasn’t as creative with them as you are! Very awesome Jodi! And so perfect for a guy! I agree…it’s a great set! I love how you used it here, and the colors are so sharp…the black and green really compliment each other! This is one of my favorite cards using this stamp set. Awesome job! Perfect take on the sketch Jodi! 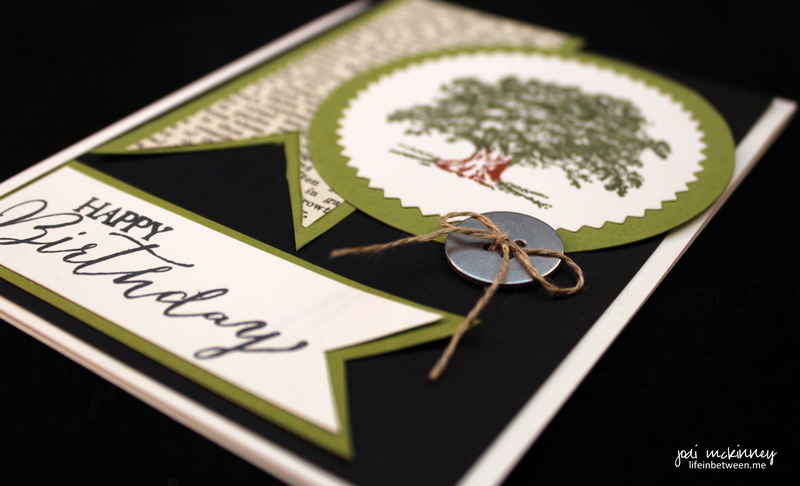 This stamp set is such a classic and you’ve featured it perfectly. Love the way it pops on the dark background. Fabulous job! Great masculine card, Jodi! This stamp set is one my favorites for that occasion. Love how you used the newsprint as in the sketch and the button for the second circle element. Your card is beautiful!!! Love the tree! I´ll give selfmade birthday cards a first try when I´m back in Germany. Do you use some special card paper? 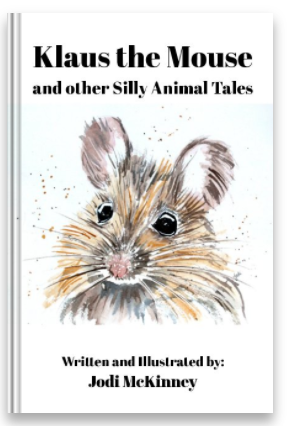 Hi Jodi, I’m wandering through by way of Pam’s Catching My Drift blog and wanted to say hi. I’m eager to explore your blog and love the variety! 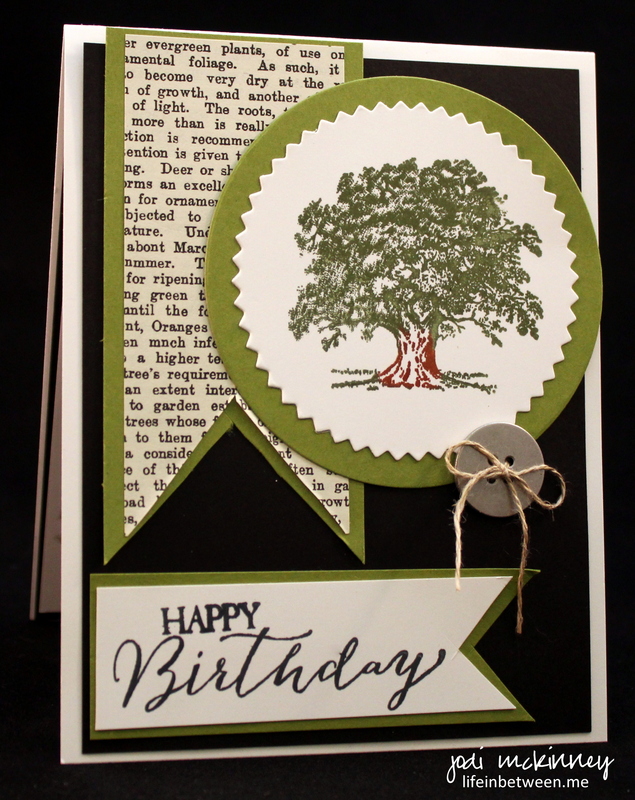 You’ve made a lovely card…esp the tree stamp and the piece of text cut into a bookmark shape. 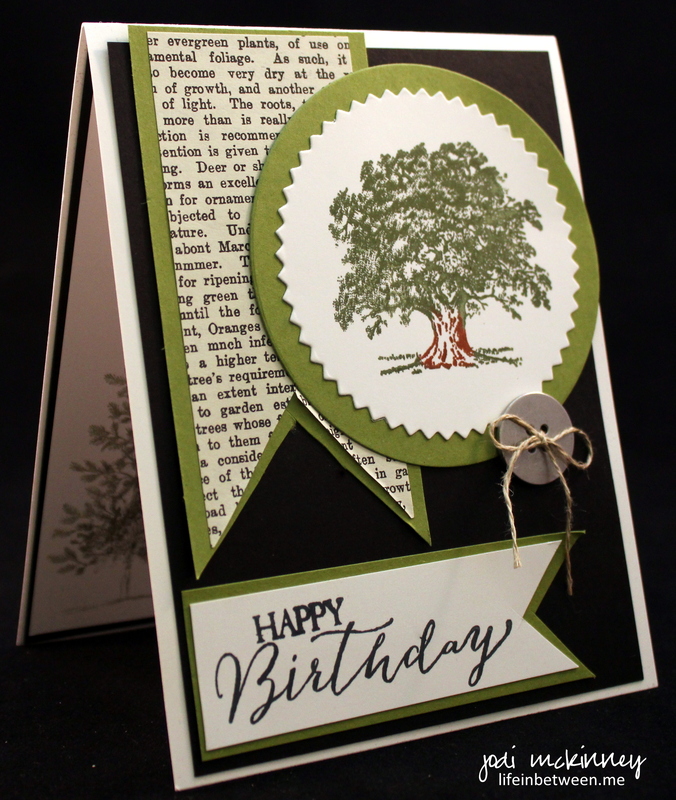 My daughter & I are into cardmaking and are always on the lookout for fresh ideas! Hi Nancy! Nice to hear from you, and I enjoy getting to know you too!